SingleParentMeet.com caters to the dating needs of single parents who would want to meet someone new. Everyone agrees to the fact that it is hard to socialize and find potential partners when we have a child to take care. It is for this reason that SingleParentMeet.com has been created. Single parents who may be straight or gay join the site for friendship, companionship or to search for a partner for a long-term relationship. The site is the great place to start searching for the right one. It is worth to give this site a try. Although SingleParentMeet.com is designed for single parents, it also welcomes anyone who are interested in them. There are more chances for single parents as the site offers a more intimate dating site suited for their needs. The gender ratio of users ofSingleParentMeet.com shows more males than females. Free Trial: Valid for three days, but does not include full features like the messaging and the private mode features. Note however that the three and six months subscription are paid in full (3 or 6 months) before the member can use its features. Unique community. Specifically designed for single moms and dads, the site is perfect for the relationship needs of its members. Even if there are members who are not single parents, they are those who want to meet and accept partners with children. As a result, they add to the membership diversity and don't pose as a challenge to the majority. Partner website support. As the single parents find its way to meet like-minded people, they can avail the babysitting services of SingleParentMeet.com's partner site (www.care.com). Low cost. 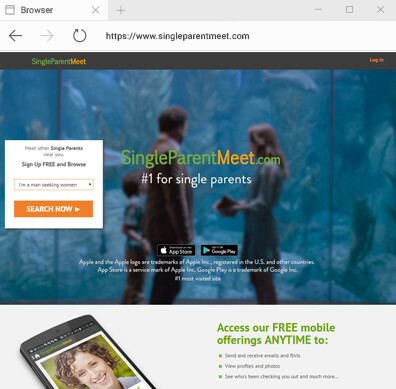 Compared with other dating sites, SingleParentMeet.com has a lower cost for around $6.99 a month for a six-month subscription. Diversity. Members can find users of all orientations, races, educational levels, and various background levels. Limited free trial. A free trial is supposed to give the member a 'feel' of how it is if they become a member with a paid subscription. However, the site's free trial doesn't allow members to read or send messages. They can't also identify who have liked or favorited their profile. Homepage. The homepage ofSingleParentMeet.comdoesn't look orderly enough and it has redundant options. It also greets the visitor with a video which doesn't prove to be useful for someone who wants to know more about the site by reading about it and navigating its features. No phone number. If the member has a problem, he or she has to go through the FAQ section and if the member doesn't find the answer satisfactory, he or she has to send an email to the knowledgeable support staff. Their staff normally responds to inquiries within 2 days. Search. To find one's potential partner is to use the search method by filtering it with preferred age, gender, etc. To get more chances, members include the basics of their appearance and lifestyle as well as upload photos and video/audio clips. "I'm interested". This is a neat search feature that shows the pictures of members so that viewers can browse on them and send a flirt to those they like and wait to see if they respond. Matching based on astrological sign. SingleParentMeet.com can help its membersfind apotential partner with its matching feature based on their zodiac sign. A member must declare his or her zodiac sign so that the site can show the members with compatible signs and they can read the various ways on how they can be a good match. SingleParentMeet.com offers an easy sign up process. An initial registration takes only less than a minute requiring only few personal information such as username, password, zip code, email address and birthday. For more chances of finding someone, members are encouraged to upload photos. After signing up, members can improve their profile and start viewing other members’ profile. Many of the members of SingleParentMeet.com have successfully met a few friends or a romantic partner to share their life with. While there are members who failed to find someone compatible, the success stories of happy couples are increasing and their testimonies can be read in the website. There is always risk associated with providing one's personal information online especially for single parents who have children to take care of. SingleParentMeet.com ensures its members that they understand their situation and will always do their best to ensure each one's privacy and security while they use the services of the site. Among the safety features are the options to block or report a suspicious member. SingleParentMeet.com also features articles and tips that will prove to be relevant and useful for single parents such as information on long distance meetings and how to avoid being scammed. Upon signing up, the member can fill in as little detail until he or she becomes comfortable to complete the profile. The homepage of SingleParentMeet.com is full of useful features and notifications. It is easy to find the tabs on top as well as the various sections on the sidebar. There are various ways to communicate with other members such as Instant Messages, Flirts, Likes & Comments, etc. However, only paid subscribers can avail these features. SingleParentMeet.com is perfectly built for single parents who need a break from taking care of their children while they take their time to find friends or meet a suitable partner. It is one of the most cost-effective dating sites because of its affordable membership fees that offer various features that can greatly help its members find what they are looking for in a dating website for single parents.